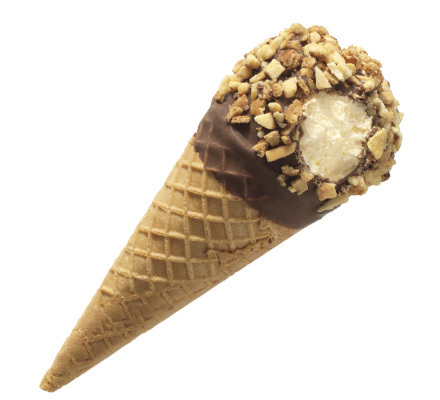 Vanilla flavored reduced fat ice cream in a sugar cone dipped in chocolate flavored coating topped with peanuts and cone pieces. Ingredients: Sugar, Milk, Bleached Wheat Flour, Skim Milk, Buttermilk, Cream, Dry Roasted Peanuts, Coconut Oil, Corn Syrup, Whey, Contains 2% or less of Unsweetened Chocolate, Cocoa Butter, Cocoa, Natural Flavors, Artificial Flavor, Food Starch-Modified, Molasses, Canola Oil, Salt, Soybean Oil, Cocoa Processed with Alkali, Soy Lecithin, Hydrogenated Coconut Oil, Mono and Diglycerides, Carob Bean Gum, Cellulose Gum, Carrageenan, Annatto Extract for Color, Caramel Color, Vitamin A Palmitate. 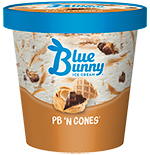 Allergen Information: Contains Milk, Peanuts, Soy, Wheat.